This is the second of the lovely Downton Abbey polishes I bought from Delush Polish. Thomas, the character everyone loves to hate! 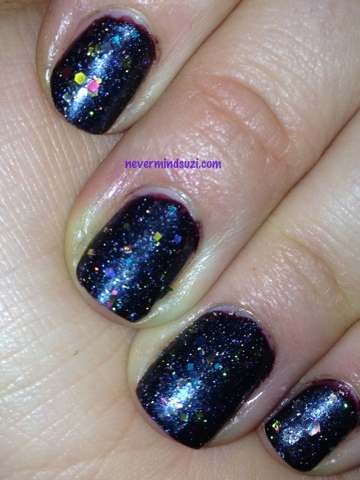 No surprise that the base of this polish is a mysterious dark black with various holographic, shimmering shapes and sparks of red and teal flecks to symbolize the fireworks he is always causing and the constant mischief he is up to! I popped this over Nails Inc - Lexington Street. It is such a glitter bomb and I can't wait to see it in the daylight (if we get any with this crazy weather) or under some florescents.